The old log school was used until the new church was built in 1896. Planning meeting was held at the home of Robert Grieve, who donated one-nineth acre of land on the north-east corner of the intersection. 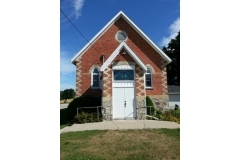 It was a red brick church with white brick trim set on a stone foundation with a good basement. It had a hardwood floor, elm ceiling and stained glass windows. The seats were fairly modern, purchased from an Arthur Church which was buying new ones. It was lighted with coal oil lamps and heated by two stoves in the basement. Official Opening and dedication took place on October 18, 1896 the day after completion. The following year the Young People purchased the first organ. The choir platform was built in 1900. The parsonage was built in 1901 on land donated by James Blyth.